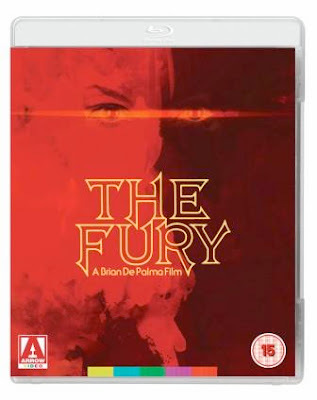 Rupert Pupkin Speaks: Arrow Video: THE FURY on Blu-ray ""
Now seems an appropriate time to revisit THE FURY. The CARRIE remake has just come out in theaters and THE FURY certainly has a little bit of CARRIE in it. Of course, director Brian De Palma also did the original CARRIE film in 1976 as well. 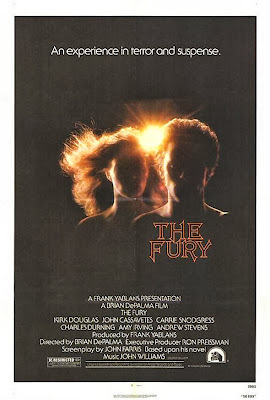 When describing THE FURY, I've always tended to call it 'Brian De Palma's X-MEN'. It's the story of an evil agency that gathers young people with psychokinetic powers to exploit as potential weapons because of their abilities. It's kind of De Palma's most adventure-y movie of this period. The score, the cast and the story feel like De Palma trying to do a Spielberg-y type movie on some level. Spielberg had already been enormously successful with JAWS in 1975 and CLOSE ENCOUNTERS in 1977. George Lucas had also scored huge with STAR WARS in 1977. I am sure De Palma was hungry for that kind of financial success as well - as Spielberg and especially Lucas were contemporaries of his. So it's my belief that THE FURY is his attempt at making a blockbuster, He even got John Williams to do the music! THE FURY also feels pretty Hitchcock as well. Not surprising coming from De Palma. So it's an interesting melange to mix this kind of dark, superhero-ish fare with a thriller. I've always found it to be a very enjoyable film. Unfortunately, the film was a very minor success(pulling in only $24 million on a $7.5 million budget). Of all of Brian De Palma's movies, this is sadly underappreciated for some reason. His comedies that came out previous too this get some attention(from the period when he wanted to be the 'American Godard') and his post-CARRIE work is some of his most popular stuff. The cast alone should garner it some attention: Kirk Douglas, John Cassavetes, Amy Irving, Carrie Snodgress, Charles Durning and De Palma regular William Finley all join in. But for some reason THE FURY was caught in some kind of a blind spot for a while where folks weren't talking about it as much as they should though. That's why I couldn't be happier to see it get the Blu-ray special edition treatment from Arrow. Transfer looks great and it sports some lovely supplements. - Brand new digital transfer of the film from the original camera negative. - Isolated John Williams score. 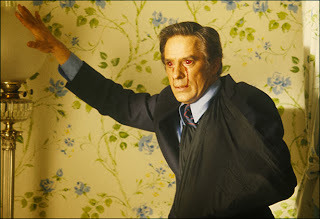 - Blood on the Lens: An interview with Cinematographer Richard H. Kline. - Spinning Tales: Fiona Lewis on starring in The Fury. 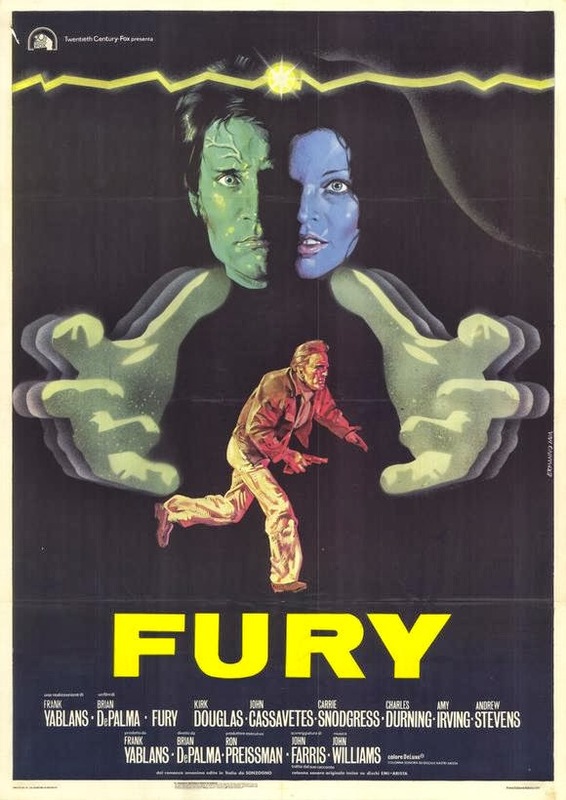 - The Fury - A Location Journal: An interview with Sam Irvin, intern on The Fury, author of the film’s shooting diary and then correspondent for Cinefantastique magazine. 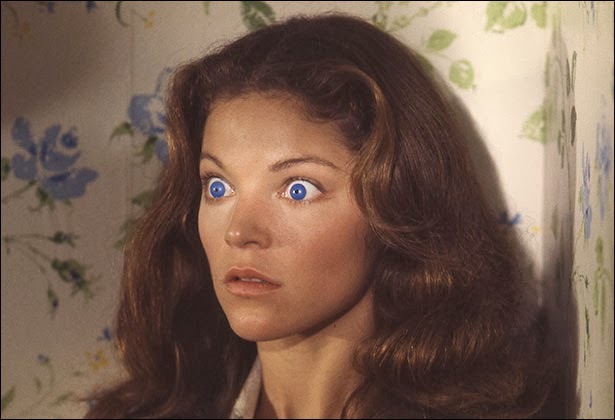 - Original archive interviews from the 1978 promotional tour, featuring Brian De Palma, producer Frank Yablans and stars Carrie Snodgress and Amy Irving. - Double Negative: A short film tribute to Brian De Palma by Sam Irvin, starring William Finley. - Gallery of behind-the-scenes production images. - Reversible sleeve featuring original and newly commissioned artwork by Jay Shaw. - Booklet featuring new writing on the film by Chris Dumas, author of Un-American Psycho: Brian De Palma and the Political Invisible, as well as a re-print of a contemporary interview with Brian De Palma, and a brand new interview with screenwriter John Farris on the writing of the film, his and De Palma’s unrealised adaptation of Alfred Bester’s The Demolished Man and more, illustrated with original stills and posters. Indeed I believe De Palma was working on the big-budget adaptation of Bester's The Demolished Man and specifically took this best-selling book on to "prove" he could deliver such a film. Didn't play out that way. I think I learned this from Irvin's original Cinefantastique articles back in 1978.